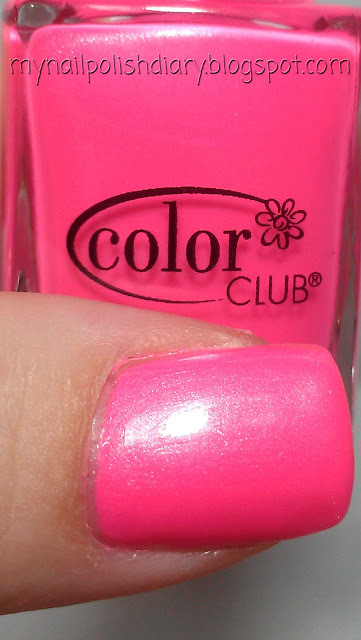 My notd today is Color Club Electro Candy from the Electric Candy Collection released summer 2009. I actually got this as a set from Ross a few weeks ago and strangely enough it's the entire collection unlike what you normally get in these sets. I was pretty pleased. 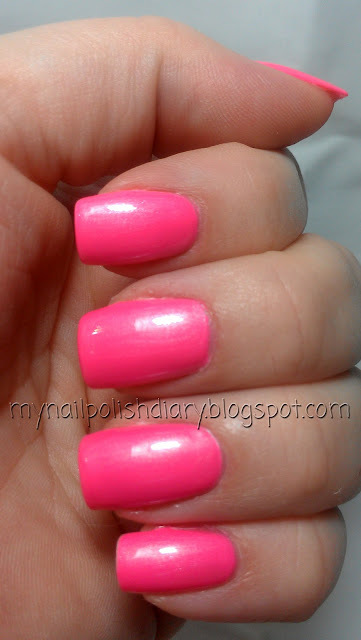 Electro Candy is a very bright neon pink with a really pretty teal blue shimmer. The set comes with a Vivid Color Intensifying top coat that seems to be a quick dry top coat. I'm not positive though. It did dry really quick and with a lot of shine. I recommend using it with any of the colors from this set. It really does intensify the color and makes the shimmer more noticeable. The wear on these was fine for me. The application was ok. The polish is really thin so you need to be careful while applying so you don't flood your cuticles. It's not that bad but if you're not careful you will get flooding. I really liked wearing this color. At first I was like woah this is baaa-riiight! But after a bit I was really digging it. If you see this at your Ross I say grab it and have some fun. The colors are nice and they all have a cool shimmer to them. What do you think about neon polish? Totally not polish related...Wow Blogger changed their UI. I was like "aw man" when I first saw it, but in about 15 seconds I changed my tune. Props to Google/Blogger for this change. I likie! Dude, a neon pink shimmer sounds awesome!! I want this. And you're right, it is crayzay bright! Liesl check your Ross! The whole set is shimmery fun-ness!